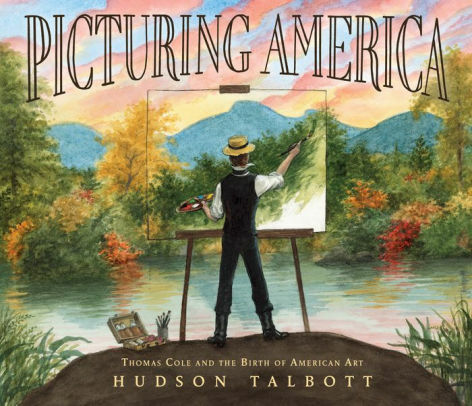 Picturing America is an appealing picture-book biography of one of the originators of distinctive American Art. *Picturing America: Thomas Cole and the Birth of American Art by Hudson Talbot. Nancy Paulsen books, 2018, 31 pages. How does an immigrant boy from England become an iconic American painter? That’s the story of this beautiful picture book. Art and artists are natural fodder for picture books, and we’ve given starred reviews to several (see our booklist!). The best of these titles are not only aesthetically beautiful, but also tell a compelling story in its proper historical context while presenting well-rounded biographical subjects. Picturing America does just that for a painter who deserves to be better known. Thomas Cole followed a road of ups and downs for decades before hard work and diligence eventually paid off. As one of the founding members of the “Hudson River School,” (a genre, not an institution!) his subject was the beauty of the wild American landscape—not only a wilderness to conquer but a magnificent canvas for painting American dreams. The dream paid off for Cole. Besides the landscapes, his allegorical paintings, faithfully reproduced, will fascinate young readers and might even stimulate some thoughtful discussion. Next PostArt and the Picture Book: a Redeemed Reader Booklist!